Undefeated in regulation since Doug Weight took over as head coach, the New York Islanders are just three points out of a playoff spot. With three games in-hand over the Philadelphia Flyers as well, the Islanders definitely control their own destiny. Thanks to the superb play of John Tavares and Thomas Greiss this season, the Islanders are still playing meaningful games. But in order for the team to make the playoffs, they’ll need more than Tavares, Greiss and even the excellent play of Anders Lee and Josh Bailey; they need Andrew Ladd and Ryan Strome to solidify the second and third lines. Ladd was signed to a seven-year contract this offseason to replace Kyle Okposo and play alongside Tavares. That hasn’t exactly gone as planned. Although he’s been better as of late, with five goals in his last 11 games, he only has two points this season while sharing the ice with Tavares. Far more successful with Alan Quine and Jason Chimera, Ladd can be a dominant second liner and solidify the Islanders’ secondary scoring if he keeps up this pace. And while he’s not playing with Tavares, that’s no excuse for him not to produce. Quine has been the Islanders’ second best face-off man all season and Chimera’s speed will open up ice for anyone he plays with. What Ladd has to continue to do is find space so he can shoot. And when not with the puck, he’s got to get into dirty areas. At the end of the season, garbage goals look the same on the stat sheet as highlight-reel ones. 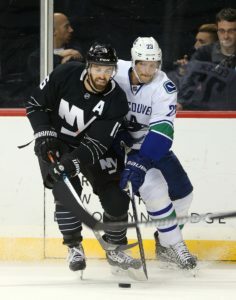 While Ladd was also brought in to be a leader in the locker room, he hasn’t exhibited the same amount of grit as he has in the past. At times, he’s even looked lost. In order for this team to realize their potential, Ladd has to be a leader on and off the ice. Ryan Strome’s goal on Tuesday against the Capitals was a long time coming. Going 10 games without a goal, Strome, now relegated back to wing, has yet to reignite the fire he had in his first full season in 2014-15. 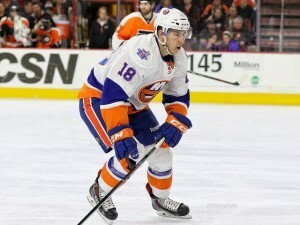 Much like last year, Strome has reveled in mediocrity. With over 30 games left however, there’s plenty of time for Strome to get hot. And he needs to. With the trade deadline and expansion draft looming, he’s running out of chances. Much like his linemates Brock Nelson and Anthony Beauvillier, Strome is streaky. There are times when he looks dynamic, like the first-round pedigree the Islanders drafted. There are other times, however, when he coughs up the puck and is scared to shoot. He simply has to shoot more. Playing all season with the Islanders’ top power-play unit, Strome should have more than seven goals this season. If Strome can at least begin to create and get to the 15-goal mark, while Ladd gets back to respectability and scores 20 this season, the Islanders will have enough weapons to keep defenses busy. That will allow the Islanders’ first line of Bailey, Tavares and Lee to stay fresh in crucial game moments and see the Isles in every hockey game they play down the stretch. With 22 games left on the road, the Isles need all the help they can get. Getting Strome and Ladd to really contribute is a huge part of that.